Re Form: Why Libraries are the Future of School. Yes. You have to be crazy to be a high school teacher. You have to be crazy because you will never have enough time to teach everything you want to teach. You have to be crazy because there are a whole bunch of people who don’t know your job trying to tell you how to do it. You must be insane because everything those people want you to do, takes away more of the one thing that you already don’t have enough of. You must be mad because teaching is hard. It’s incredibly difficult to guide one person to an intellectual epiphany. Impossible to guide thirty people, in a fifty minute period, five times a day, a-hundred-and-eighty times a year, to the exact same place–whether they want to go or not. That’s right. I said impossible. Pacing guides, formulated curriculum, laboratory tested strategies, that whole school-as-business factory model, does not work. All the accountability in the world will not make a system built for cars suitable for humans. And that’s okay; we don’t need it to. You can keep your padded room, your prescription pad, your slippers and baskets, because nothing comes more naturally to our species than learning. It’s is our defining characteristic. We can reason beyond instinct, create beyond immediate necessity. Learning is natural, it’s the assembly line isolation and uniformity that isn’t. Have I told you how much I love ﻿my public library? My middle daughter has read her way through all of the vampire books. Now she’s discovered the Fruit Basket manga series. In two weeks, she’s devoured nearly the entire collection. My youngest, another daughter, has an aesthetic that embraces everyone from Neko Case, to Jimi Hendrix, to Miley Cyrus. She flits between CDs, DVDs, and “chapter books” moved less by preference than by wonder. My son regularly checks out his limit in classic rock, old school rap, and seminal comedy CDs and DVDs. Oh, he doesn’t like to read, but he loves to apply the sharpened wit and critical insights gained from the art and poetry of resistance, to everything he has to read, and see, and hear. I finished Mary Roach’s, Packing for Mars last week, watched Hitchcock’s Frenzy last night, and listened to those three CDs from Tom Petty and the Heartbreakers’ Live Anthology so much that I had to return them before I needed a twelve-step program. Now, I’m working on Laurel Canyon by Michael Walker, with Adrian McKinty’s Fifty Grand on deck. The library is a place for pursuing the ever-shifting shapes of our passions. School should be the same. Technology is a powerful tool for getting us there, but it is not a substitute for the professional learner. As that professional, I am adept at braiding not just ideas and information, but patterns of structure and style into my writing, my teaching practice, and my world view. I pull threads from that vast tapestry to construct the metaphors and analogies that can bridge the gap between where students begin, and the place that their internal drive to know and understand propels them to go. In life I’m Odysseus; in class I’m Mentor, and I’m crazy about my job. If you want to help, and I’m idealistic enough to believe you do, please get out of the way. We can do this, but not if we’re constantly distracted from our purpose by things that force us to do, less effectively, that which we’re already doing. We can create real change that finally crumbles the bars of social Darwinism, but not if we’re starved out of our schools from lack of funding. We can, as professionals, continue to push each other from behind and pull each other up that mountain of “refinement,” but not if we’re afraid that innovation will lead to punishment, or that adopting today’s curriculum will only mean that we’ll be wrong tomorrow when everything changes again. And please, if it’s not too much trouble, stop blaming “bad” teachers for a bad system. It won’t mean that you’re not needed. I heard there’s some problem with the economy or something. Perhaps, you’ll have better luck looking for some “bad” CEO’s. Maybe they’re Waiting for Wonder Woman. 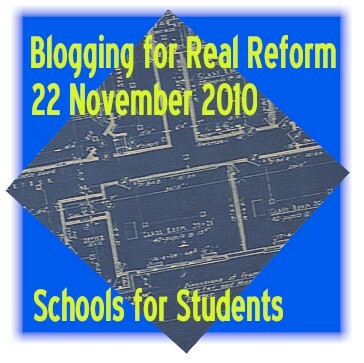 5 Responses to Re Form: Why Libraries are the Future of School. I agree that teachers have to be crazy as well, but I think they need to be crazy because that would make class more fun. If the teacher is boring and normal, class won’t be fun and we won’t even try to learn anything. Having a crazy teacher just makes learning fun. Libraries are also very important to learning. When kids find books that they like, they read them. Reading helps them look at ideas in different ways. It opens up new paths in the brain. Reading something one way can be completely different from another way. It’s all about how you see things. I agree that teachers are crazy because they do not have enough time to teach everything they know. It is also hard for them to teach students who are not interested in what the teacher is teaching. That is why libraries are a great place for students to go! They are able to explore books that they think are interesting, so they will learn the material better. I agree that most teachers can be crazy at times. They are crazy because they have to teach for six hours a day for fifty minutes and they wont have enough time to teach everything they have to. About half the kids in the class aren’t interested in what the teacher is teacher, so the students should be able to go to the library. They can read a book about what they are learning to make it more interesting or pick a different topic. Rock on! And in theory, you love your school library as well. When I see students truly engaged in discovering, curious about the world, I am elated. I am saddened, though, when students are told to “research” and then the teacher sits at the computer and does her grades, or attendance, or whatever other task the teacher has been assigned. As you point out, technology is not an event, it is a means, and truly collaborative, critical, life-changing learning comes from inquiry. Long live the library, long live the librarian!